Risk insurance, Intellectual property protection, learning about PPSR and cyber-attack insurance, doesn’t sound like the most riveting subject, but to business owners it can determine whether a business survives or not. The expert panel gave advice on how to insure against a cyber-attack or a breach or an attack on your intellectual property. They also discussed a new and innovative way to protect your personal investment in your business in the event of insolvency, a number of options and possibilities were discussed to effectively protect you and your business in a cost effective manner. These are just some of the questions that we would ask, when our Advisors are supporting our clients when establishing, buying or selling a business. The seminar was a great success, very interactive with a lot of audience questions and participation, which is very interesting considering the rather “dry” subject matter. It goes to show that business owners are thinking about their exposure, in a variety of different areas, and looking for options to manage that risk. 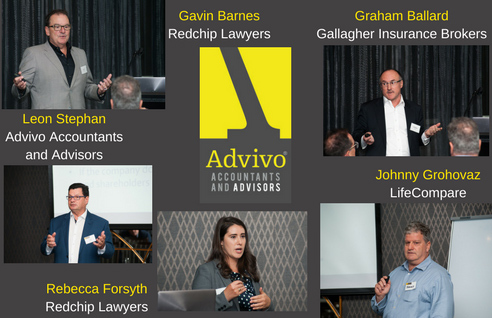 Advivo in conjunction with our partner Redchip Lawyers, have recently developed a product, utilising the PPSR legislation, that from day one of the companies existence can make you the secured creditor and put you at the head of the creditors que, not the end as normally would be the case, in the event of an insolvency event; which can happen for all sorts of reasons outside of your control, such as the failure of a large debtor or supplier, no matter how well you manage the business. Understanding and applying the PPSR legislation proactively and efficiently has all sorts of benefits, one recent example saw all outstanding debts fully recovered at settlement when the business sale was finalised, which would not have happened otherwise. If you have a great idea and would like to start a business, talk to Leon Stephan, he specializes in risk assessment and helping people make sure they have minimized as much exposure and as economically possible, allowing them to build a firm base for a successful business. These skills also extend to buying and selling a business, Leon’s knowledge and depth of experience is not something that can be “bought off the shelf”, so give our office a call and make an appointment today!